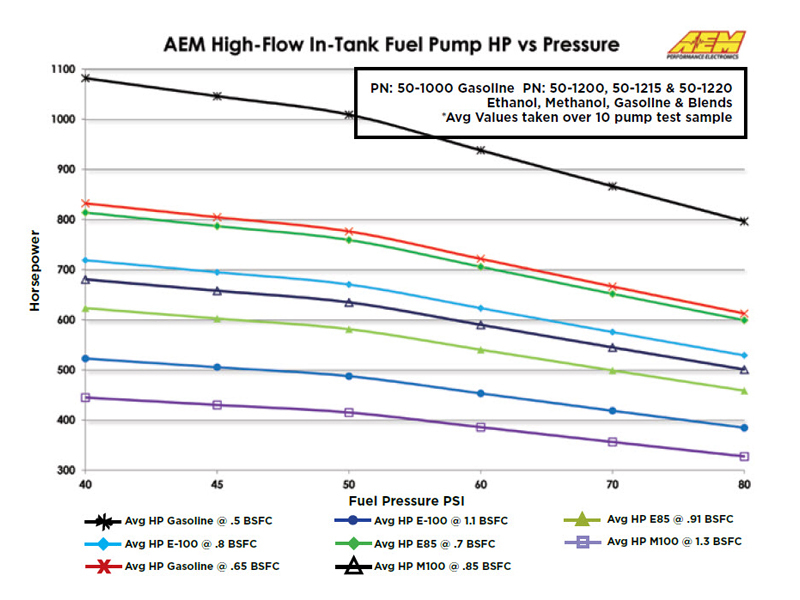 AEM has updated the flow ratings of its In-Tank and Inline High Flow Fuel Pumps! 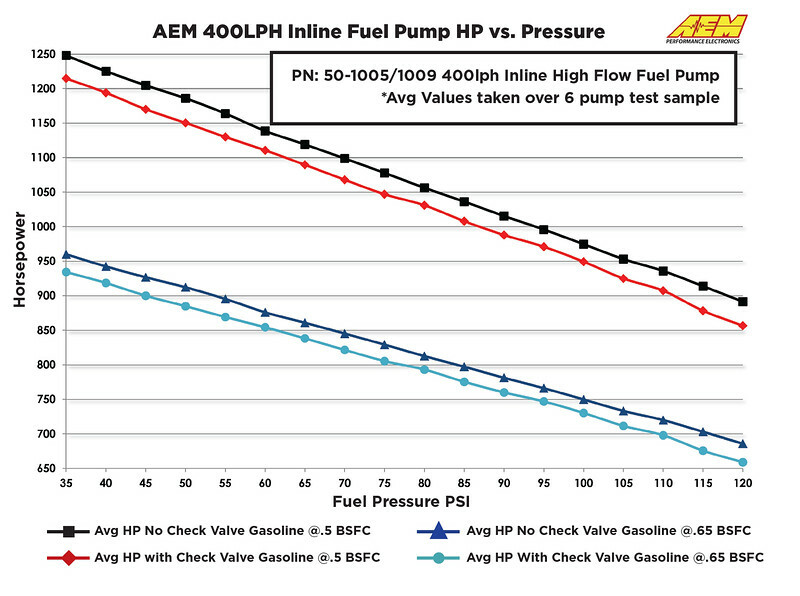 AEM In-Tank fuel pumps are now rated at 340lph @ 40 PSI fuel pressure, and Inline fuel pumps are rated at 400lph @ 40 PSI fuel pressure. AEM’s High Flow In-Tank Fuel Pumps (PN 50-1000, 50-1200, 50-1215 & 50-1220) are designed for high performance naturally aspirated and forced induction EFI vehicles. Our In-tank pumps flow up to 340LPH (90 GPH) at 40 PSI and are capable of supporting over 1,000 HP at 43 PSI. 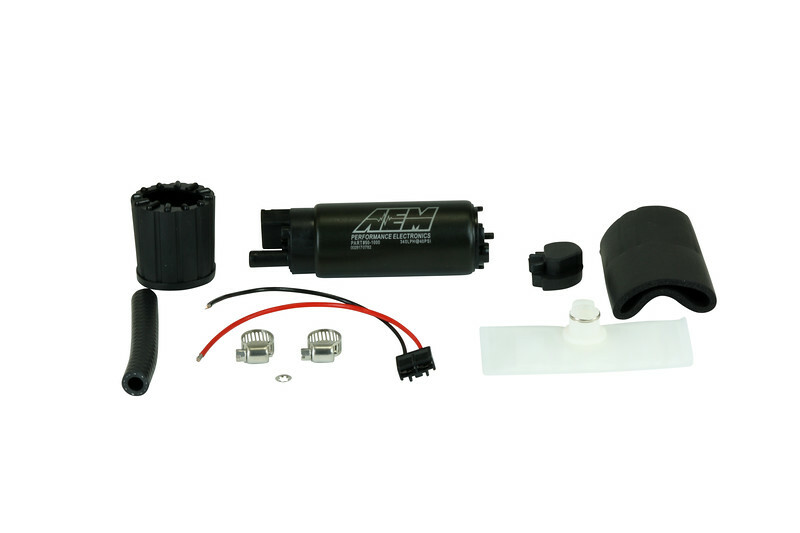 AEM black anodized in-tank fuel pumps are for use with gasoline only and green top ‘E85’ fuel pumps are compatible with E100 ethanol, M100 methanol and all gasoline types. 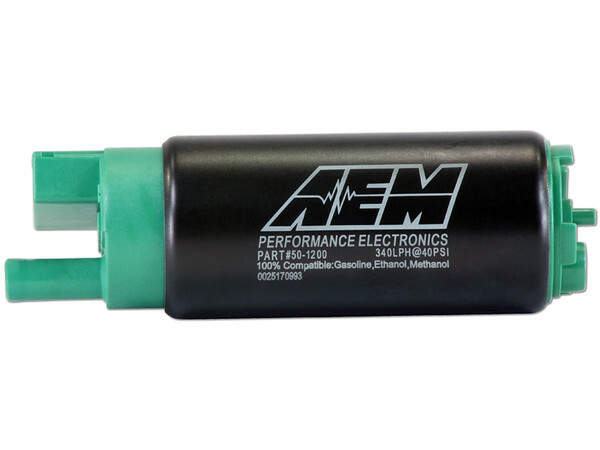 AEM’s E85-compatible High Flow In-Tank Fuel Pumps feature robust internal construction that is designed to withstand the low lubricity characteristics of ethanol and methanol fuels. 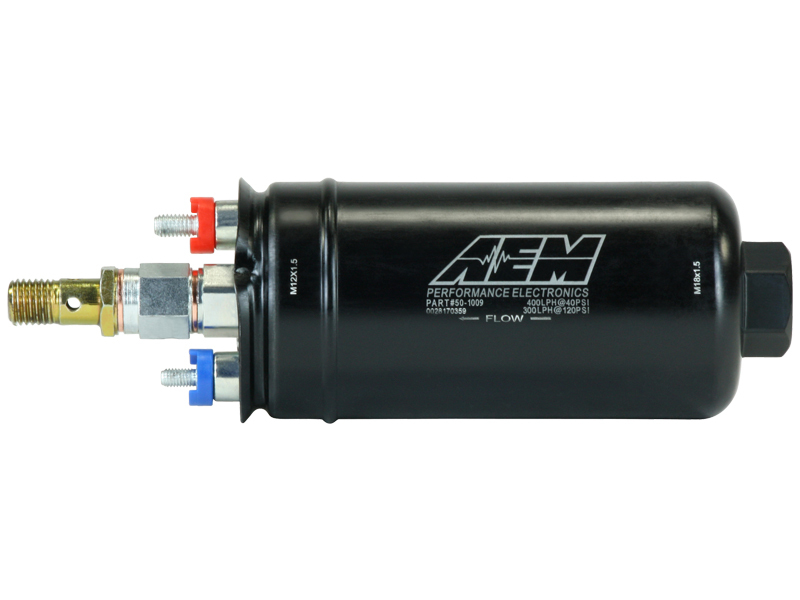 AEM’s Inline High Flow Fuel Pumps can be installed externally or in-tank using optional hardware that is sold separately. 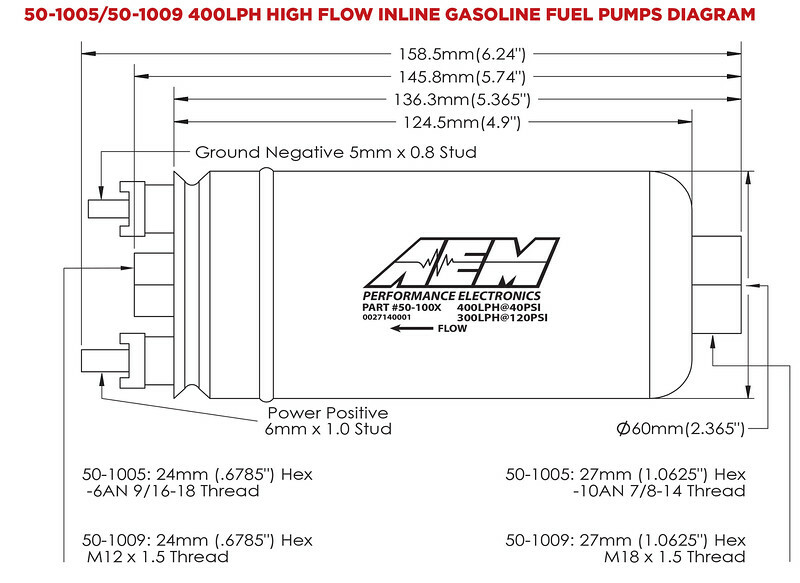 Both AEM Inline Fuel Pumps utilize the industry standard “044 Style” envelope. The PN 50-1005 High Flow Inline Fuel Pump has -10 AN female inlet and -8 AN male outlet connections for easy installation on new applications and for quick replacement of existing competitor fuel pumps. The PN 50-1009 Metric High-Flow Inline Fuel Pump has an M18X1.5 female inlet and M12x1.5 male outlet, making it the ideal direct replacement upgrade for 044 fuel pumps. Both AEM High Flow Inline Fuel Pumps are capable of supporting over 1,200 HP normally aspirated and 860 HP at 30 psi boost*. These fuel pumps flow 400lph (105 gph) at 40 PSI, 340 lph (90 gph) at 73 PSI, and 270 lph (71 gph) at 120 PSI. AEM 400LPH Inline Fuel Pumps are rated for blended ethanol fuels (E85/E90), however the use of 100% alcohol fuels may diminish pump life. AEM HIGH FLOW INLINE FUEL PUMPS MAY BE USED SOLELY ON VEHICLES USED IN SANCTIONED COMPETITION WHICH MAY NEVER BE USED UPON A PUBLIC ROAD OR HIGHWAY, UNLESS PERMITTED BY SPECIFIC REGULATORY EXEMPTION (VISIT THE “EMISSIONS” PAGE AT HTTP://WWW.SEMASAN.COM/EMISSIONS FOR STATE BY STATE DETAILS. INSTALLERS/USERS LOCATED OUTSIDE THE UNITED STATES SHOULD ACT IN ACCORDANCE WITH THEIR LOCAL LAWS AND REGULATIONS. Advanced Engine Management’s performance electronics are Engineered to Outperform. The company designs, manufactures and assembles engine management systems, digital dash displays, wideband air/fuel systems, water/methanol injection systems, performance gauges, data loggers, boost controllers, ignition components, fuel delivery components and adjustable cam gears at its corporate headquarters in Hawthorne, CA.